Physical training for triathlon, by its very nature as a time trial sport, typically involves putting in repeated steady-state efforts in order to mimic what happens during a race. In many events, the athlete is often competing against themselves and is putting out their best consistent effort based on how they trained. It is often said that boring training is smart training, like swimming 30 x 100 on 2:00. That sort of thing. But it doesn’t have to be all repetition and the same old thing. Some of my athletes have training routes or test days that I (they) like to use to gauge their current fitness outside of “normal” parameters. I’ve worked with pro triathlete Brent McMahon for more than 20 years. From a junior to ITU athlete to IRONMAN 70.3 champion—to now a five-time IRONMAN champion. Over this time we have refined and dialed in what he is capable of so there are no surprises. However, part of the reason we have been able to work together for so long is that we often change gears as well as change our focus. It is important to occasionally mix things up a bit when preparing for some of his favorite races. Even before Brent moved up to the IRONMAN distance we would head to Maui every year for a training camp, and at some point during the schedule there is an ascent of the Haleakala volcano. One of the reasons behind this is that many pro cyclists like to use the 35 mile, 10,000-foot vertical climb as a gauge of their fitness. The road climbs up from sea level and passes through a lush, tropical rain forest and a temperate zone before winding up through a lava strewn mountainside—with every type of weather along the way thrown in for good measure. On top of that, as one ascends, the oxygen level continually decreases. Being able to maintain a steady effort over close to three hours and ending in the depleted air of the summit is a challenge that is just not ordinary. Another possible event for those who include mountain biking in their repertoire, would be entering a marathon off-road event. The change in scenery, the personal challenge as well as the nonlinear nature of that sport can often be just the ticket in the precompetition phase of an athlete’s build. Many of my athletes look at this sort of thing as a real treat. One thing that needs to be considered when planning epic or different workouts is their purpose and also the effect on your overall training plan. There is no point in considering an outside-of-the-box day if it is going to leave you shattered for days, or possibly injured. An over-distance swim, bike or run workout will generally be self-limiting in terms of output or pace, however it is important to keep nutrition and hydration on task. Always have a good idea as to what the session is designed to accomplish. For some athletes this is about building confidence. For newer IRONMAN athletes, just being able to swim 3800m, bike 120 miles or run a marathon on separate occasions is a huge boost to their mental game prior to the event. For experienced athletes, having a chance to test themselves in a new or unfamiliar context provides enough excitement to offset the regular grind of day-to-day training. A sample swim workout that I often give my athletes as a challenge set at the end of a winter swim block is to have them swim 50, 75 or 100 X 100m . Before starting, we select a pace time that is achievable over the entire set (adding 10-15 seconds to one’s normal leave time is a good rule of thumb). This may seem like too much rest in the beginning, but as the set extends it becomes more and more necessary. For the 75 and 100 x challenge, take an extra 5 minutes each hour as an extra break to stretch and take in calories. For swimmers not used to daily workout sets over 3000m to 4000m, breaking the overall plan into sets of 10 alternating stroke or adding aids like fins and pull buoys will help alleviate any overuse issues. At some point in the set it will seem like the end is never going to come, however completion leaves the athlete with a huge sense of accomplishment. Sometimes the variation can come in the form of creative race preparation. Some races are challenging to prepare for, and you have to find unique ways to put together training sessions that mimic a goal race’s terrain. IRONMAN 70.3 St George has a run course with elevation gain and loss during each lap, as does the XTERRA World Championships in Maui. We have prepared for both of these events with a 2x 20-25-minute uphill brick run where Brent runs at a race pace/effort and then gets a car ride back down before starting the second repeat. The ride down provides a timely recovery and doesn’t pound the legs as much as running downhill would. Another way of breaking away from traditional training sessions is to give the athlete a local challenge. 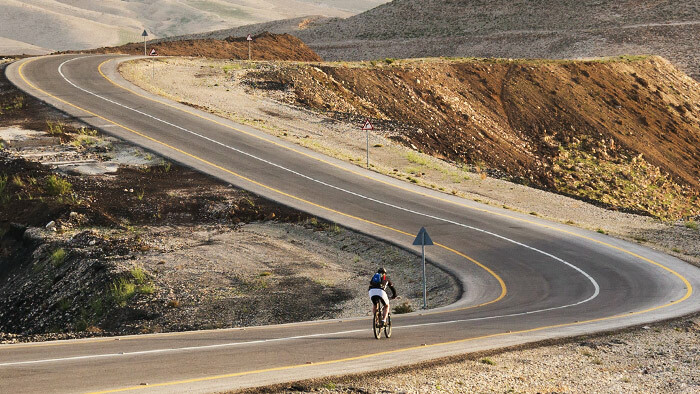 Most areas that triathletes have to train on are relatively limited in choices of roads or trails and the same ones are often used session after session. However, even within that constraint, variety can be had. Use early season long runs or rides to discover new roads—explore a route you can use later in the season when you need a race-specific workout. In Victoria, I will challenge athletes to put together a route that provides the most elevation gain in 100km without covering the same road, in the same direction, more than once. This is an excellent way to learn some of the unfamiliar roads and to better appreciate where you live. In closing, not all workouts need to be event or triathlon specific. Mixing it up with an epic ride or unorthodox run can give that much-needed mental break from repetition and provide a spark to keep things interesting.